"Maintaining veneration for Calvin, this work resolves inherent contradictions to the Gospel found in the Reformed tradition. 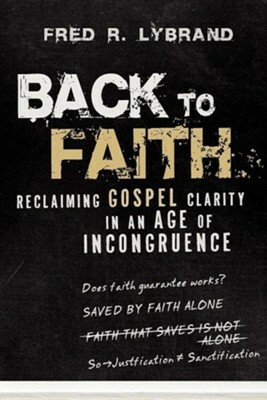 Lybrand reiterates "faith alone in Christ alone," and works accompanying salvation are "normal but not necessary" while cogently requiring the reader to reexamine theological traditions. My prayer for the mindful Reformer: Read and wrestle with these words. Be willing to abandon all, for the clarity of the Gospel cannot be undervalued." Jay Quine, ThM, PhD, Dallas Theological Seminary President, College of Biblical Studies "Fred Lybrand's analysis of the common saying, 'Faith alone saves, but the faith that saves is not alone, ' exposes the logical and biblical fallacies inherit in Calvin's famous statement. With careful exegesis he dissects James' discussion of faith and works with fresh insight into this controversial passage. When I read his doctoral dissertation I immediately encouraged him to publish this so that many others could benefit. The book is well written and finally puts Calvin's clich to rest-where it belongs." Jody Dillow, ThM, ThD, Dallas Theological Seminary Adjunct Professor of Biblical & Theological Studies at Rocky Mountain Bible College & Seminary Fred Lybrand is the Founding Executive Director of the Free Grace Alliance, and currently serves as the Senior Pastor of Northeast Evangelical Free Bible Church in San Antonio, Texas. He is the author of five other works, including Preaching on Your Feet (Broadman and Holman). I'm the author/artist and I want to review Back to Faith.